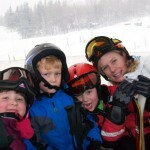 Stratton Update -- Stratton has had a great ski season to date. We started the Christmas season with 3 ' of the white fluffy stuff - We had a big January thaw and then 5 inches this week to set Stratton up for Martin Luther King weekend. We have had a number of appointments of people looking at everything from land to homes and condos. There are some values at this time in both condo's and homes. A great buy is this Birch Hill Coop apartment for $149,000. It does require all cash but has e3 bedrooms, 2 baths and a family room in addition to a nice living/dining/kitchen area with a fireplace. Birch Hill has a shuttle to Stratton Ski Area on weekends and holidays and a pretty private pool for summer time. These units have been popular with several generations of Stratton families. Another great opportunity to purchase in the Stratton area is this beautifully constructed contemporany home on top of Pearl Buck with great Winhall valley toward Bromley and looking back toward Stratton. This home offers two master suites and two additional bedrooms. The living room has a vaulted ceiling with ceiling high stone fireplace and beautiful wood floors. Kitchen should delight any chef. There is a family room with fireplace, hot tub room and two additional rooms. Listed at $959,000 but the owner has asked to hear offers. This fine home is located about five minutes from Stratton off the Stratton Access Road. Now is a great time to buy as prices are still low. Vermont is a great place to vacation and spend time with family and friends and now is a great time to come enjoy it, if you are not ready to buy try renting for a weekend or a season - summer or winter!